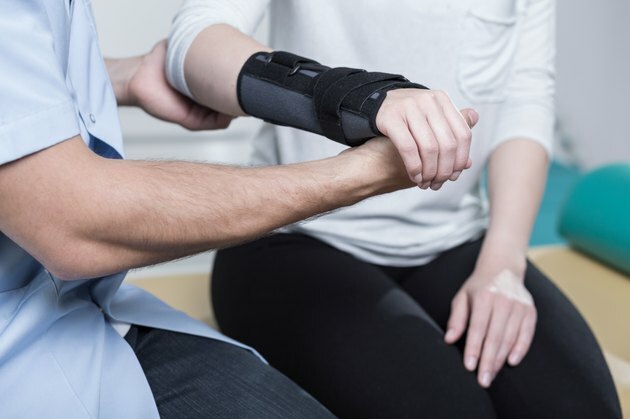 Rehabilitation is crucial following surgery, including surgeries for wrist fractures, carpal tunnel syndrome and other wrist-related problems. The speed at which you regain your wrist range of motion is an important factor in your recovery, and largely is dependent on which exercises you perform and how often you perform them. Because of the invasive nature of surgery, it's likely that you'll develop scar tissue around the incision site, which can cause adhesions between your wrist structures and reduce the ability of your nerves to glide. Specialists from the Hand Center at the New England Baptist Hospital in Boston suggest that, if you have had carpal tunnel release surgery, you should begin performing gentle exercise of the hand the day after surgery. Range of motion exercises are important after wrist surgery. However, you should avoid simultaneous wrist and finger flexion for three to six weeks, suggests the website Hand Surgical Associates, Boston. Keeping your fingers straight and your thumb extended, slowly and deliberately flex your wrist forward until you reach your end range of motion. Hold this position for one or two seconds, then extend your wrist as far back as possible. Perform 15 repetitions of this exercise two to three times per day. After you have performed your wrist flexion and extension range of motion exercises, perform side to side movements of your hand, also called medial and lateral deviation of your wrist. Keeping your fingers straight and your thumb extended, slowly and deliberately move your wrist from side to side. Hold your hand at your end range of motion for one to two seconds before switching to the other side. Perform 15 repetitions of this exercise two to three times per day. The principle rehabilitation objectives following your wrist surgery--especially wrist fracture repair surgery--according to the website of the Sports Science Orthopaedic Clinic, "are to improve the elasticity of the wrist joint and to gradually increase pain-free range of motion in the arm, hand, and fingers." Performing the wrist flexor stretch helps you achieve these objectives. Extend your affected arm in front of you until your elbow is straight. Turn your palm up. Grasp the palm and fingers of your affected side with the palm and fingers of your opposite hand, and gently pull your affected side hand back until you feel a light stretch on the inside of your forearm. Hold this position for a three to five seconds, then relax for three to five seconds. Perform 10 repetitions of this exercise two to three times per day. The pronation/supination exercise helps strengthen weak muscles in your wrist. Perform this exercise by extending your affected side arm into the handshaking position. Turn your palm up. While keeping your upper arm and shoulder locked in place, slowly and deliberately rotate your hand from a palm-up position to a palm-down position. At your end range of motion, hold this stretch for three to five seconds before rotating your hand back to a palm-up position. Perform 10 repetitions of this exercise two to three times per day. As your wrist rehabilitation progresses, you'll be able to add a small weight (1 to 3 lbs.) while performing this exercise. Check with your doctor or health care professional to determine the appropriate time for you to incorporate free weights into this exercise.